It seems Atlanta is always playing host to some big convention, sporting event, concert, or major business gathering. That means a whole lot of tourists visiting the ATL throughout the year who need to be fed. 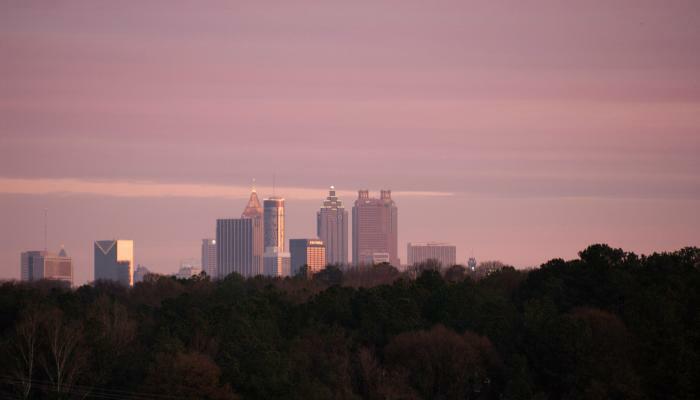 Locals know the restaurants to steer clear of, and generally avoid dining in tourist-heavy areas like downtown Atlanta where chains and overpriced restaurants dominate the landscape. But, a few places in the A successfully blur the line between total tourist traps and restaurants locals aren’t afraid to be seen in on occasion. Have a worthy tourist trap restaurant suggestion not listed here? Give it a shout out in the comments or via the tipline. Located beyond the gates of Braves SunTrust Park, the Battery Atlanta complex with its shops, restaurants, and hotels was built with visitors in mind. Restaurants like Ford Fry’s The El Felix for Tex-Mex, Latin sandwich shop El Super Pan, C. Ellet’s steakhouse and oyster bar, Antico Pizza, and Garden & Gun Club for Southern bites and cocktails are popular dining choices for locals and visitors regardless of whether there’s a game or a concert at the park. In business since 1956, The Silver Skillet serves a classic Southern breakfast with exactly zero frills. The restaurant is packed every morning with city dwellers, college students, and nearby office workers and hotel guests regardless of the day of the week. The Majestic on Ponce de Leon has been soaking up Atlanta’s booze since 1929. The restaurant is open 24/7 and serves up strong coffee with diner classics like steak and eggs, biscuits and gravy, grilled cheese and fries, and the Ponce dog piled high with chili, cheese, and onions. It’s a popular stop for tourists and locals seeking comfort food; especially in the wee hours of the morning. This iconic strip bar located in the basement of the newly-renovated Hotel Clermont on Ponce is a frequent stop for tourists and locals. And, it has been for over 50 years now. The dubious vice den is where to head for cheap PBR and shots and a peep show filled with aging strippers; including everyone’s favorite, Blondie. Watch the Atlanta living legend crush a few beer cans between her breasts. Two rules to abide by at the Clermont: no touching the entertainers and absolutely no photos allowed. If the topic is Atlanta’s best fried chicken, Mary Mac’s on Ponce has to be one of the top contenders in the city. The restaurant has plenty of experience, too. It’s been serving traditional Southern fare for more than 70 years to tourists seeking an infusion of Southern hospitality as well as locals coming in for sweet tea and fried chicken after church. Once home to Sears, Roebuck, & Co. and City Hall East, Ponce City Market (PCM) just off the Eastside Beltline is now Atlanta’s newest tourist destination. The ground floor food hall is home to several restaurants owned by Atlanta’s most notable chefs like chef Linton Hopkins’ Hop’s Chicken, W.H. Stiles Fish Camp from Bacchanalia’s chef Anne Quatrano, chef Hector Santiago’s Latin sandwich bar El Super Pan, and restaurant and cocktail bar the Mercury, from the team behind Decatur’s the Pinewood. On the roof, there’s a mini amusement park called Skyline Park along with a full-service restaurant 9 Mile Station and cocktail bar RFD Social in the tower. On weekdays, PCM is full of nearby residents and office dwellers grabbing lunch or dinner. However, locals generally avoid PCM on the weekends when the market becomes overrun with tourists. The Varsity is likely Atlanta’s biggest tourist trap. It still offers the most famous hot dog in the city. And, some locals are willing to brave the crowds for it—even on the weekends. Opened in 1928, the restaurant has served just about everyone. That includes a few presidents like Jimmy Carter, George H. Bush, and Barack Obama, as well as movie stars like Clark Gable and business tycoons such as Warren Buffett. When the car hop asks, “What’ll ya have”, the answer is a chili dog with a frosted orange. Lines form early to get into the The Vortex in Little Five Points on the weekends. Some of this is due to suburbanites heading into L5P on weekends to do a little people-watching and vintage clothing shopping. But, there are locals here, too, who come for the lack of children (the bar is 21 and up) and Atlanta’s most outrageous burger. For those daring enough, order the Triple Bypass: three patties, three fried eggs, 14 slices of American cheese, 10 slices of bacon, two grilled-cheese sandwiches serving as buns. Vortex also has a location in Midtown with a comedy club, the Laughing Skull Lounge. Few restaurants in Atlanta give diners of today a window into the past quite like Trader Vic’s. Opened in 1976 in the basement of the Hilton Atlanta Downtown, the interior hasn’t changed in its 42-year history. The half-off mai tai cocktails still draw a crowd on Thursday nights. The restaurant is often full of tourists and Atlanta residents seeking an infusion of vintage, Polynesian pop culture paired with strong tiki drinks. Fun fact: Atlanta is home to one of two Trader Vic’s remaining in the United States, and the only one still associated with Hilton hotels. Fox Bros. Bar-B-Q, on the border between Candler Park and Little Five Points, is probably the only restaurant on this list where the line between tourist trap and local hangout simply doesn’t exist. There’s never not a line at Fox Bros., and that line is filled with everyone from nearby residents to suburbanites to tourists to barbecue enthusiasts. Fox Bros. is just good food and good vibes. Grab Texas-style barbecue, tater tots covered in chili and cheese, massive short ribs, and Frito pie here. The iconic Sun Dial restaurant atop the Westin Peachtree Plaza gives diners a birds-eye view of the city skyline from 723 feet above the street. The restaurant often caters to hotel guests and locals seeking a truly unique Atlanta experience. The Sun Dial has played host to many an anniversary, birthday celebration, and several sky-high marriage proposals. Most Atlantans wouldn’t qualify Busy Bee Cafe as a tourist destination, simply a much-loved, decades-old restaurant for great soul food. Over the years, visitors to the city have also discovered this Atlanta institution. The restaurant recently garnered national attention through the Netflix show “Ugly Delicious” with chef David Chang. In business since 1947, this Vine City staple serves some of Atlanta’s best fried chicken alongside an assortment of other meat-and-three staples. It’s always packed, so be prepared to wait. Busy Bee is opening its second location downtown next year. The Dwarf House in Hapeville is where it all began for the Atlanta-based fast food chain Chick-fil-A back in 1946. But, this isn’t just any old Chick-fil-A. The Dwarf House includes a full-service restaurant serving an expanded menu filled with burgers, sandwiches, an all-day breakfast, and their most notable dish, the open-faced Hot Brown sandwich. The Chick-fil-A hot brown is served with chicken rather than turkey, bacon, and a whole lot of cheese. Sorry, it’s still closed on Sundays.